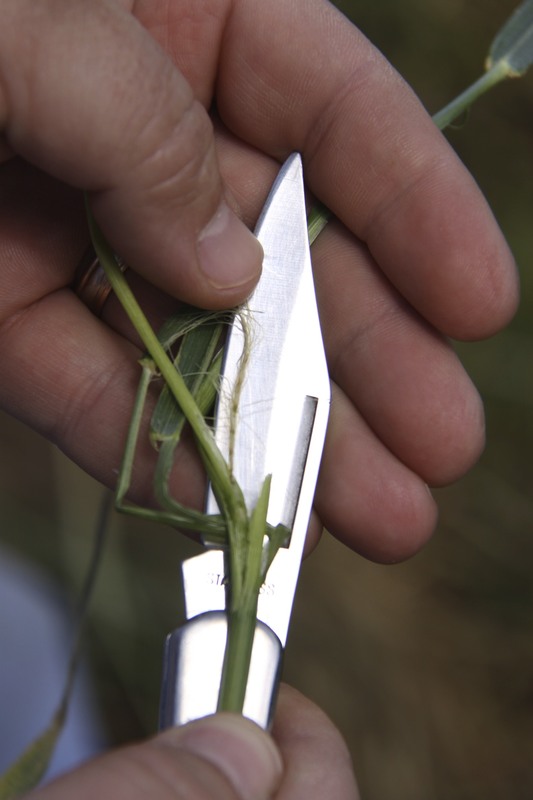 This blog post is an abbreviated posting of our wheat forage results. 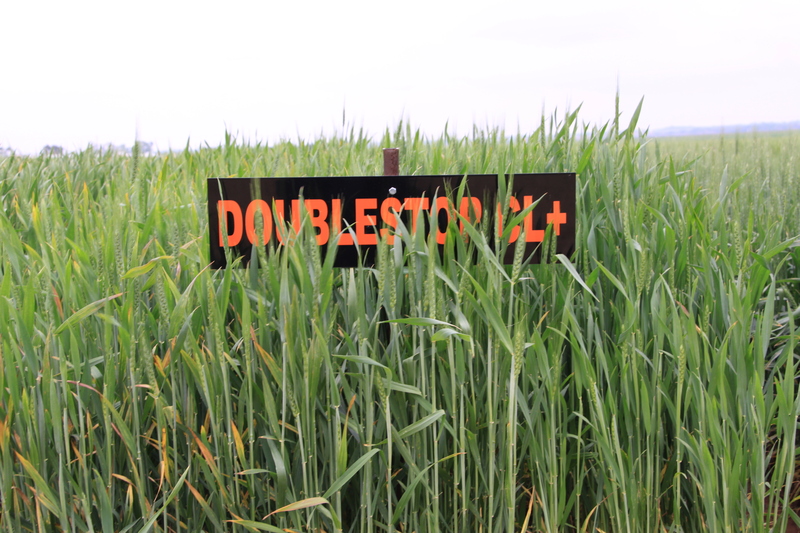 For the complete report, consult OSU Current Report 2141 Fall forage production and date of first hollow stem in winter wheat varieties during the 2013-2014 crop year by clicking here. 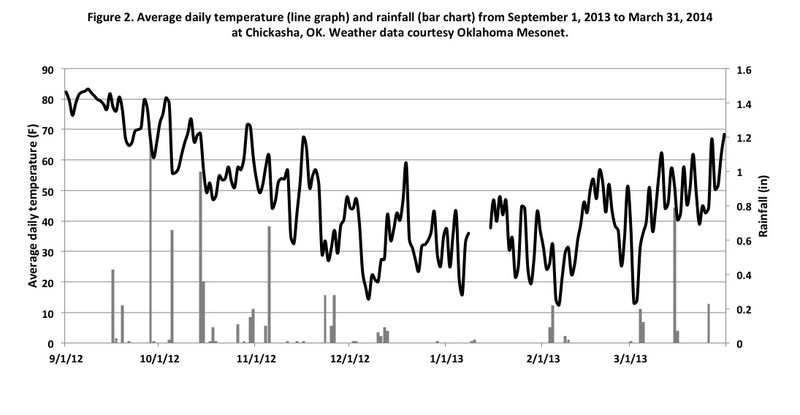 As was the case across most of Oklahoma, our wheat plots were sown into dry topsoil in late September. Soils in southwest and northwest Oklahoma were extremely dry due to multiple years of drought, and wheat pasture was short in these areas of the state. Summer rainfall provided ample subsoil moisture in the central part of the state, but topsoil was largely dry through September. Rains fell across much of the state in October and provided the fuel needed to build wheat pasture. Unfortunately, these October rains would be the only significant rainfall events most of the Oklahoma wheat crop would receive . Fall forage production by winter wheat at Stillwater and Chickasha averaged 3,240 and 2,580 pounds per acre, respectively (Tables below). There was a large group of varieties at Stillwater and Chickasha that produced statistically equivalent forage yield, and producers are encouraged to consider two and three year averages when available. Table 2. 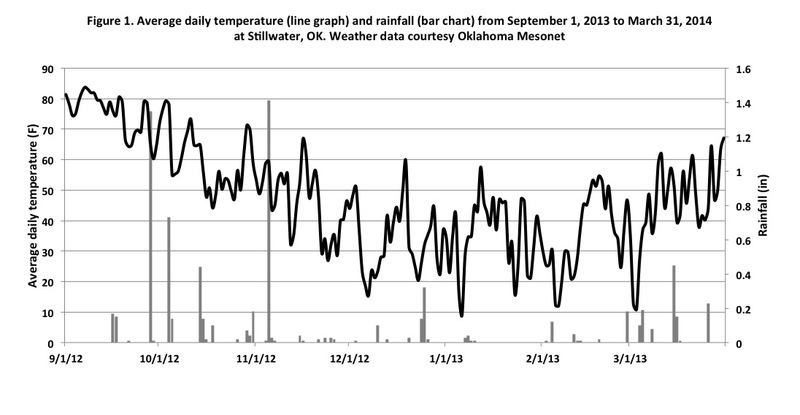 Fall forage production by winter wheat varieties at Stillwater, OK during the 2013-2014 production year. Table 3. Fall forage production by winter wheat varieties at Chickasha, OK during the 2013-2014 production year. First hollow stem data are reported in ‘day of year’ (day) format (table below). To provide reference, keep in mind that March 1 is day 60. Average occurrence of first hollow stem at Stillwater in 2014 was day 77. This was approximately five days later than 2013 and 25 days later than in 2012 and was the result of much cooler than normal temperatures. Unlike previous years, there was only about ten days difference among varieties in occurrence of first hollow stem. Oklahoma: Wheat around Stillwater is mostly at GS 10.5.1 (start of flowering) and is looking dry. With temps forecast in the upper 90s for the next 3-4 days and no rain, conditions will continue to deteriorate. Areas in other parts of the state are worse, with only a few areas better. This past week I traveled from to southwestern OK stopping at numerous fields along the way as well as the variety trials or demonstrations at Kingfisher (60 miles southwest of Stillwater), Granite (southwestern corner of OK) and El Reno (20 miles west of OKC). Typically wheat was at my knee height or shorter and thin. I saw no foliar diseases, but did find several locations where I believe wheat streak mosaic and/or high plains disease was present. Samples are being evaluated to confirm, but samples processed by the Diagnostic Lab this past week from the panhandle and from central OK would support this (i.e., positive for Wheat streak mosaic virus and/or High plains virus). I also have noted symptoms of barley yellow dwarf in my trials around Stillwater, but no stunting is associated with these symptoms most likely indicating a spring infection. I did have a report from Roger Musick in central Oklahoma that he found a high incidence of tan spot and light leaf rust in a no-till wheat field under pivot irrigation. That is the only confirmed report of foliar disease I have received. Mississippi Dr. Tom Allen (Extn Plant Pathologist, Mississippi State University) 03-May-2014: Wheat throughout MS ranges from flowering north of Highway 82 to wheat that has likely reached ripening stages south of I-20 (I haven’t seen as much of that wheat in more than 2 weeks). Trace levels of wheat rust were observed in the Greenwood, MS area on Tuesday by a chemical distributor field rep. I confirmed the observation by text photo. In addition, I was able to find a few stripe rust infected leaves on the experiment station in Stoneville last Friday. I haven’t made much about the stripe rust confirmation because the plants were volunteer plants under a rainout shelter. I was shocked to see that most of the infected leaves had already formed telia as a result of the warmer temperatures. At present, we have not confirmed stripe rust in either a commercial field, variety trial plot, or any other part of the state. Quite frankly, this is one of the cleanest wheat crops I’ve observed. Until the past week the only observable diseases were bacterial leaf streak throughout much of the state and Barley yellow dwarf virus. I rated the variety trial south and west of Hattiesburg a few weeks ago and also observed a low level of scab at that location. Some Septoria leaf blotch has been observed, tan spot in a few fields in eastern MS, and some glume blotch. In addition, since we were so wet and cold throughout much of the winter, and the rain continued, field work has been way behind so we’re starting to get some calls regarding glyphosate drift as well as paraquat. This week I visited several wheat fields around the state and looked through the plots that I have at the Lon Mann Research Station at Marianna. Overall I would say the crop is later than it was last year, which seemed very late. Many fields in central Arkansas heading this week, fields in south Arkansas generally headed last week and by this time next week most fields in Northeast Arkansas will likely be fully headed. According to the Arkansas Agricultural Statistics Service report, for the week prior to April 28th only 17% of the crop had headed. This compares to 67% for the five year average and 32% last year. Overall the crop looks okay, but I can tell the last few weeks of rain has taken a toll on it with yellow pockets of wheat from mud holes is more common than it should be. 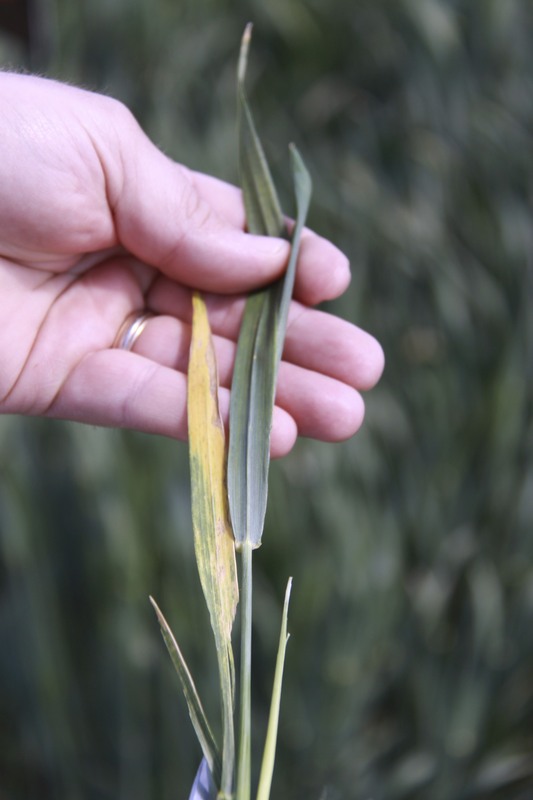 Foliar disease levels have been low with the exception of Septoria leaf blotch, which is common in most fields lower in the canopy, but has moved up the plant in the last week on more susceptible varieties. I found a small hot spot of stripe rust on Wednesday April 30th at my plots at Marianna. This was the first reported stripe rust in the state. At this point with most wheat headed, heading or will be headed by the end of next week, stripe rust will most likely not have enough time to get well established and be a big issue this year.